It’s early morning on the island of Kauai, and the normally humid heat is cool. Hawaii-native Mike Coots drives through the dawn, navigating his pick-up truck over potholes in worn dirt roads to park near the pumping blue surf. He watches the waves for a few minutes before he grabs his fins and boogie board and walks up the beach. But, just before he gets in the water, Mike takes off his right leg. A shark-attack survivor, Mike lost his right leg after being bitten by a tiger shark when he was 18. Yet, having one less limb doesn’t hinder him from doing what he loves and being in the environment where he feels most comfortable — the ocean. And despite the nature and location of his attack, Mike has overcome his fears to get back in the water. His positive attitude is something that’s never wavered, and it’s helped him always see the glass as half-full. The attack happened while Mike was out surfing with a few friends. He was paddling for a wave before feeling an immense pressure on his legs as the shark bit. Instinct took over as Mike tried to pull his legs free before eventually swinging at the shark’s nose. The shark finally let go and Mike scrambled to shore. One of his friends quickly made a tourniquet with his surf leash, and they threw him in the back of a truck and raced off to the hospital. They arrived at the ER, before Mike was lifted out of the truck, immediately blacking out. They sent him into emergency surgery. “I remember my eyes opening, and I’m in this dream-like state. My mom is looking at the doctor, and the doctor looks at my mom. My mom tells me, ‘Mike, you lost your leg.’ I was thinking that they were telling me I was gonna die in a couple minutes, and I had to say my last wishes. I was like, I know. I saw it come off. I was there,” Mike says. Even though Mike was able to joke about his situation with his family, he still had a long road to recovery. And at just 18 years old, his reality was overwhelming. “While I was in the hospital, I was visited by a man who was wearing pants. He came really briefly and just said a couple words. I’d never seen this guy, but he left and my mom told me he had a prosthetic leg. I was like, ‘What?’ She told me that’s what I was gonna have pretty soon. And it was a total light switch switching on,” Mike says. 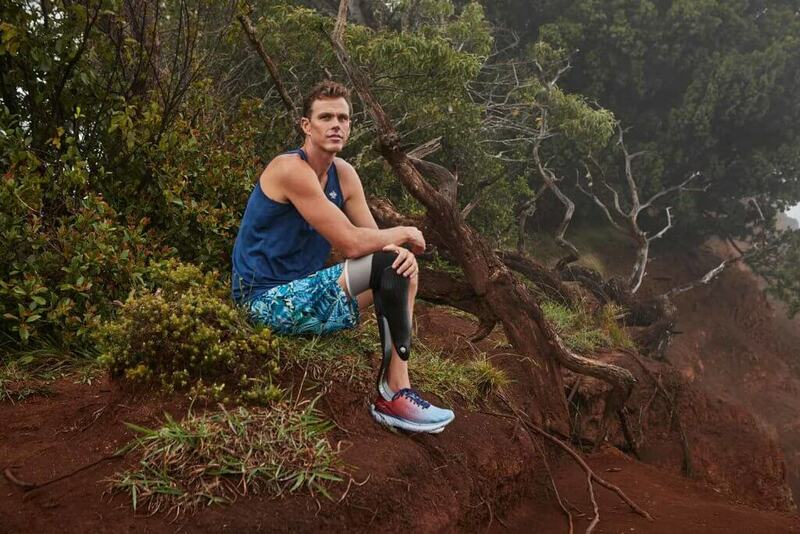 As an athlete, Mike’s way of life rapidly changed, but all Mike could focus on was the ocean. “The hardest part about the shark attack wasn’t nearly losing a limb. It was being out of the water for nearly a month and not riding waves with my friends,” Mike says. 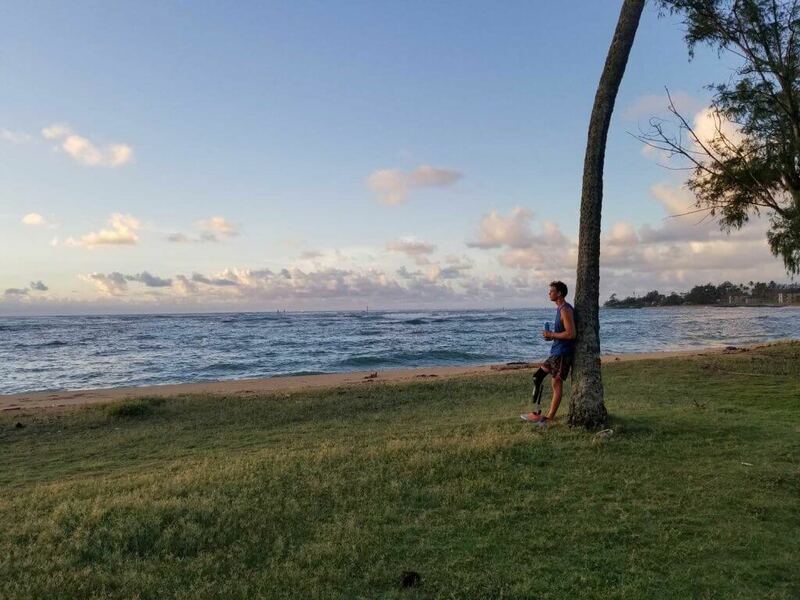 Previously it had all been about the ocean, but now it was all about his prosthetic. “It’s crazy how something with carbon and steel can dictate your life. Your leg is your transportation. It’s your self-worth, your health, your self-esteem, your way to get to work, your way to see your family. It really is everything,” Mike says. But for Mike, the most important thing was being able to get back in the water. He sent a letter to Ossur, an Icelandic prosthetic company, asking if they could help him with a surfing prosthetic. Initially turned away, Mike gave up hope and went about his life. But a few months later, he saw an unread Facebook message from the company. Within a few weeks, he was flying to Iceland to work with Ossur and get fitted for a surf prosthetic. And on his last day there, they unexpectedly gifted Mike with a running blade. “I put it on, and I was running again. I ran, and it was incredible. I just started crying. I’d never felt that movement, that inertia. That flow and the feeling of the wind on your face. Even though we were indoors on a track, I could still feel that. I hadn’t felt that in years, and I just started crying,” Mike says. So many years later, Mike still remembers the man who visited him in the hospital and gave him hope. Something that he prioritizes in his own life. “I really found value in seeing other people doing things with their prosthetic and being able to live their lives normally. I think that by being there for others and having them see that I can do these sports, it really gives them a little bit of hope that they can do it as well,” Mike says. Mike was lucky enough to meet Chase Merriweather, a quadruple amputee from Philadelphia. “Chase is an amazing kid, and I’ve always wanted to have him come to my home and see the island. The first time I met him, I could just tell this kid is special. He had glasses on, and he rode his boogie board up to the sand. He dry docked, but he kept kicking and moving his arms to get further up the beach. He was just so excited. I was like, this is what surf stoke is,” Mike says. Finally, everything worked out and Chase and his family were able to come visit Mike’s home in Kauai. “Chase and I are similar in that we don’t let what’s missing define who we are. During this visit, I’d hoped he’d return home with surf stoke and a big smile. Now I think I’m smiling just as big,” Mike says. But, Mike isn’t just spreading hope or positivity for other amputees. A big part of what he does is actually helping raise awareness and advocacy for the species that almost took his life. “I got involved in wanting to help protect a species that nearly took my life because I found value of this species. Sharks are much needed in our oceans, and I think it’s just by being in our water so much that I realized all systems are connected. The ocean has given me everything in my life. It literally has given me everything. And if there’s any little way I can give back to that, so be it,” Mike says. Mike’s advocacy first started as he was doing extensive researching looking for answers why he was attacked. “I knew every single thing about what sharks had done to humans. But, I had no idea what humans were doing to sharks. And I soon learned what humans were doing to sharks and it didn’t seem right,” Mike says. And before he knew it, Mike was getting back in the water with the animal that almost killed him. “The first time I came face-to-face with a shark after the attack, it was a bit scary. About two minutes in the water, that fear went way and curiosity jumped in. It was about a half-hour dive and when I got back onto the boat, I was like, this is the most incredible thing you can do on earth. This is something I want to do for the rest of my life,” Mike says. To many, what Mike does would almost be too much to bear — getting back in the water let alone swimming with and touching sharks. But, Mike’s positive attitude has always been steadfast. “Life throws us these incredible curve balls, and it’s really how we deal with them that defines us. It can throw you bad cards, and you just really don’t know what you’re going to get. But life can also be beautiful and you can take those cards and flip it around and have a lot of fun with it,” Mike says.